at that moment everything went fabouless for him his intergration went prefect he had no troubles with "Le Francais". with his loved country Morocco. Morocco and will do anything for my country". 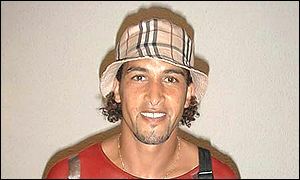 Mustapha Hadji has had to overcome the bitter disappointment of missing out on playing in his third World Cup finals for Morocco. He's doing that by helping Aston Villa challenge for the English Premiership. 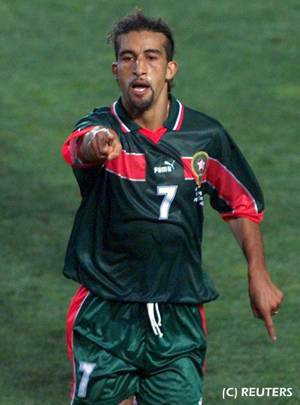 Hadji made a name for himself at the 1998 World Cup finals. Wearing his familiar red boots, he scored one of the goals of the tournament and was subsequently voted African Player of the Year. 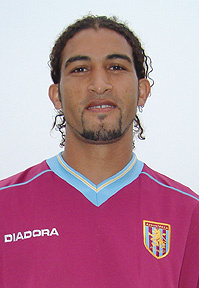 After taking an impromptu holiday and then missing his flight home, the Moroccan star is back to answer your questions. Will you play for Morocco in the Nations Cup finals? MH: Yes, I would like to play for Morocco at the Nations Cup but it's a shame that I will miss many games for my club here in England. As for friendly matches, I have to wait and see what happens as we still have some time before January but I'm sure I'll play in some of them. Are you retired from international football? If not, how long will you carry on playing for Morocco? Well, I started playing for Morocco in 1993 and I've really enjoyed it, all the pride of playing for your national team, it's something special because you're playing at the highest level. Now I'm now 30 years old and I want to put more time and effort for my club Aston Villa, so I may stop after this season. Who do you back for next year's Nations Cup? Senegal surprised us all because nobody expected them to do well at this level. I think it's going to be Cameroon because they're the best team in Africa. What do you think of Morocco's chances in Mali, especially as they face South Africa, Ghana and Burkina Faso? It's going to be hard, it's a hard group but you never know in football. We have a good team in Morocco although we didn't qualify for the World Cup. I think we have a good chance of qualifying from our group. Why do you think Morocco failed to qualify for the World Cup? We were in a difficult group and games against Algeria and Egypt are always big derbies for us. Senegal surprised us all because nobody expected them to do well at this level. Our problem was that we didn't do well in the away matches and we need to work on that in future. Do you feel Senegal deserved to qualify ahead of Morocco? Definitely, because they worked harder than us and played good football as well. I know many players from Senegal and I think they're going to surprise many people at the World Cup. Morocco have many great players, but why don't their results reflect that? I think at the moment Moroccan football is down. This is a difficult question but I think at the moment some of the players don't have enough motivation when they play for the national team. They don't put as much effort as they do for their clubs. It's a shame. What level is Moroccan football compared to the rest of the world? I think at the moment Moroccan football is down, we are not playing like we did in the last four or five years. This is a shame because everything depends on the motivation of the players, when they play well the level of the national team goes up. Do you think your club Aston Villa has what it takes to get a Champions League place next season? I think we have a good squad with quality players, we're currently doing well in the league and if we continue to work hard, we have every chance of qualifying. Apart from the recent game against Newcastle, we have played every well and if we continue like that, we can finish in the top three. Which team is the biggest threat to Aston Villa? Er...er...this is another hard question. It's difficult to say but I just want to say that we have many great players determined to work hard for the team. All the teams in England are very good but we want to do well against every one of them. Do you miss playing in France, Spain and Portugal? No, I don't think so. What I miss are the friends I had in France but I'm really enjoying my time here in England, and I'm also enjoying my football. So I don't miss much about those countries. Which club have you enjoyed playing for most? 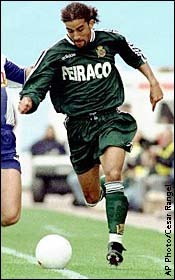 When I was at Sporting Lisbon I played Champions League football and played at a very high level with some very good players. But I think the best for me is Villa because playing in the Premiership is something else, big games every week and fantastic atmosphere. Are you aiming to finish your career in Europe or would you like to go back to Morocco one day? I like the man, he has a big heart and stays simple. No, I'm never going to play football in Morocco because I never played in the Moroccan league in the first place. I grew up in France and started to play football there when I was 14 years old. I'll go back to my country not to play football but for holidays and to see my friends. Maybe I'll stay in England because I'm enjoying life here. At the moment I don't know. Why do you keep your ponytail? I like it though! Aah..well, it started off as a superstitious act because I seemed to play well with the ponytail. But now I just keep it for fun and it's part of my style. Who are your favourite African players? George Weah because I like the man, he has a big heart and stays simple. He's done a lot for his country so he's a very big example to all the African players. 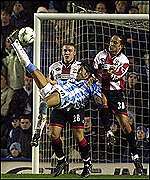 After George it's Abedi Pele because when I was 16 years old I was looking up to him at Marseille, he was a great player. He started to play football just when he was 14 years old. It's a relative late age to play football but everything went very good. progressions and were playing very good. he is talentive,fast,and can read the game quickly. him playing and gave him an invitation directly. team and that was his big dream. or the National Moroccan A team and he chosed for the right team.And he always tell everybody that he made the right decision. Zambia and Morocco had to win to get a ticket to the world cup finals.And Hadji made his debute and played very notacable and good. and left the club going to Deportivo la Corua. 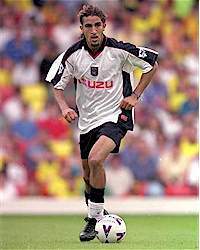 He played there together with Nourredine Naybet and Salahedinne Bassir. He stayed there for two seasons and played very well. he wouldn't make to play in the world cup finals because that's the last thing that can happen to you if you know that you will play in the cup finals. for 100% for the games. played his best match with Morocco ever in his hole career! of Hadji during the game. that he had trouble with his toe he played with a broken toe! 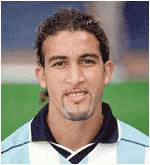 befor moving to Coventrycity FA. but that can happen to you and to every famous player if you are Ronaldo or Maradonna or some one else it happen some time to you.